Submitted by Haafu on July 12, 2010 - 12:46am. Submitted by Wolfin on July 12, 2010 - 12:49am. Submitted by Lehooo on July 12, 2010 - 1:14am. Congratulations!!! I hope you'll be very happy! Submitted by Gygaxis on July 12, 2010 - 1:23am. Hehe! Congratulations thats wonderful news! Submitted by ConnorElzaim on July 12, 2010 - 2:21am. 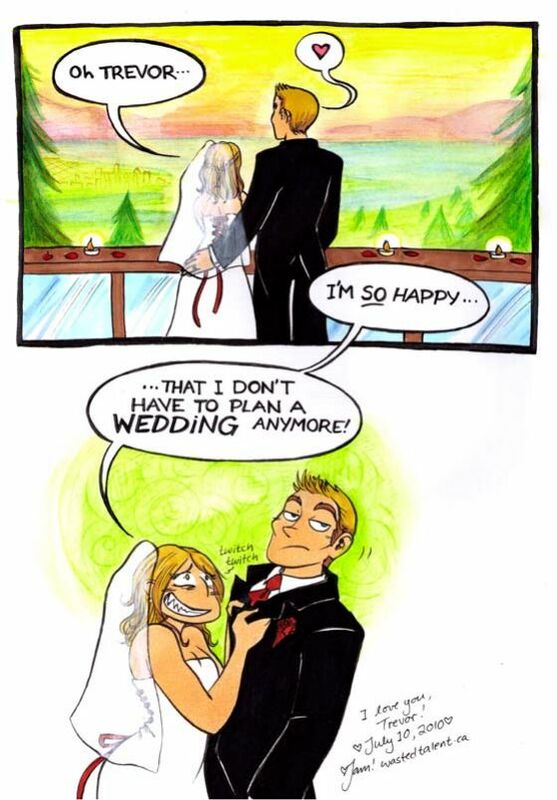 My sister gets married this August, I can only imagine this will be her reaction when all is said and done. Submitted by Esuka on July 12, 2010 - 3:04am. Submitted by Sidhekin on July 12, 2010 - 3:41am. Submitted by Junodog on July 12, 2010 - 3:49am. Submitted by mmbah on July 12, 2010 - 4:03am. Submitted by Max77 on July 12, 2010 - 4:07am. Submitted by Jam on July 14, 2010 - 3:36pm. Submitted by wasted Tom on July 12, 2010 - 4:14am. Submitted by KittyCanuck on July 12, 2010 - 4:15am. Submitted by Kathalia on July 12, 2010 - 4:44am. Submitted by Kathalia on July 12, 2010 - 4:52am. Oh! And your flowers and dress look gorgeous, and Trevor looks handsome. I hope the wedding was perfect. It sure looks that way from the pictures of your smile and the view! Submitted by edcalaban on July 12, 2010 - 6:38am. Submitted by LaMs on July 12, 2010 - 6:41am. Submitted by Ethan8 on July 12, 2010 - 6:44am. Submitted by melimsah on July 12, 2010 - 7:55am. Submitted by melimsah on July 12, 2010 - 7:56am. Submitted by BinaryDigit on July 12, 2010 - 8:34am. Submitted by Curtis the Barbarian on July 12, 2010 - 9:21am. Submitted by Curtis the Barbarian on July 12, 2010 - 9:24am. Submitted by silent_knight on July 12, 2010 - 11:08am. Submitted by greg on July 12, 2010 - 11:20am. Submitted by Yino on July 12, 2010 - 11:32am. I just registered to say: Congratulations! Submitted by Xelmon on July 12, 2010 - 11:36am. Congratz, hope it was the best thing ever! PS. : Wait a while on the kids... They will eat you alive. Submitted by satomi17 on July 12, 2010 - 1:38pm. Submitted by omniwarrior on July 12, 2010 - 3:25pm. It would be interesting if you made him an ultimatum... kiddies or kitties? Submitted by Omnomplz on July 12, 2010 - 3:45pm. After over a year of planning and stress, our day was really amazing. Thank you so much to everyone who helped make it happen!